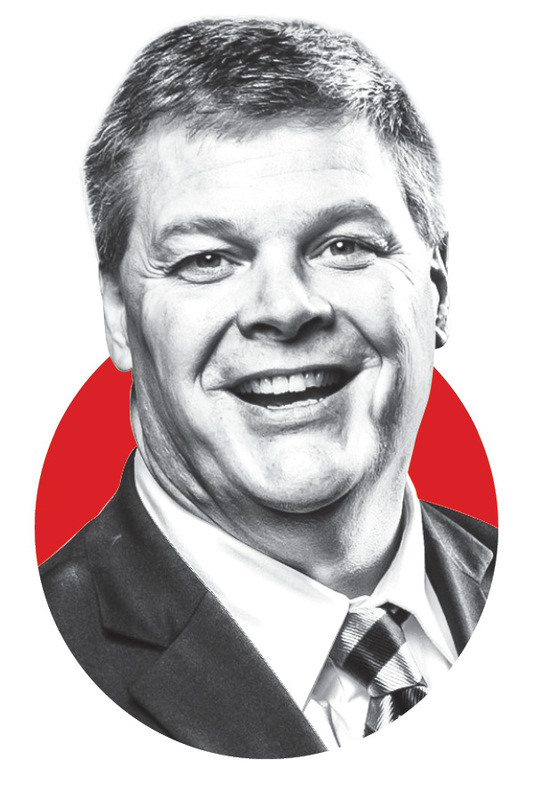 A look inside Jim Newberger’s quest for Senate. Jim Newberger steered his black SUV into a nearly empty parking lot, relishing an hour of downtime in a whirlwind day of campaigning across Minnesota. But he wasn’t taking a break. The Republican challenger to Democratic Sen. Amy Klobuchar, Newberger was in his “campaign on wheels” — a Chevrolet Traverse packed with a suitcase, an extra white dress shirt wrapped in plastic, red campaign signs, even a weed trimmer, sledgehammer and rebar so he can post up his own signs in fields and yards across the state. “Welcome to my office,” he said. A three-term state representative from Becker and a retired paramedic, Newberger is voluntarily leaving a comfortably Republican district to mount what even he calls an underdog bid against Klobuchar. Recent polls, including the Star Tribune/MPR News Minnesota Poll, have shown the two-term Democrat leading by double digits. Lifelong Minnesotan, St. Cloud State University graduate. Paramedic for 30 years at level I trauma center in Twin Cities. State representative for three terms. Vice chairman, House Jobs and Energy Committee. Taxes: Believes in lower taxes as a general principle. National debt: Says he would protect Social Security and Medicare. Immigration: Supports the Mexico border wall. Health care: Would vote to repeal Affordable Care Act. Guns: Supports the Second Amendment. See where Newberger and other Senate candidates stand on key issues. “I refuse to be another name on the ballot, to just be a placeholder,” said Newberger, who’s acting as his own campaign manager. Still, in the Minnesota Poll, two-thirds of voters didn’t recognize Newberger’s name; only 1 percent didn’t recognize Klobuchar. And in the most recent fundraising reports, Klobuchar had raised $8.5 million through the end of July and still had $5 million on hand, while Newberger had raised $107,000 and spent almost all of it. Sitting in his car, Newberger pulled out a legal pad with his to-do list for the day: call donors, rerecord an election video, design two billboards, send out thank-you notes, file a campaign spending report, call former U.S. Rep. Michele Bachmann. “Jim has been one of the hardest working individuals I’ve met in my life,” said state Sen. Andrew Mathews, R-Milaca, a friend. Newberger has built his race around supporting President Donald Trump — his campaign signs read “Protect TRUMP” — and arguing that sending Democrats to the Senate over the last decade has left Minnesota without a voice in the Republican-led body. “He’s just going to bring more of the divisiveness and hate,” said Nancy Hassett of Big Lake, head of the Sherburne County DFL in Newberger’s home political turf. She said Newberger’s politics are too far to the right for Minnesota. Newberger , Lt. Governor candidate Donna Bergstrom and secretary of state candidate John Howe talked with a local volunteer as they set out to door knock through Aurora, MN before heading to the next stop. The youngest of six, Newberger was born and raised in St. Louis Park. For 30 years, he worked as a paramedic at North Memorial Medical Center; he retired in April. Campaigning, he said, is a lot like being a paramedic, working under pressure with a team. “This is no different than an ambulance call,” he said. After getting involved with his local party, he volunteered on Mark Kennedy’s Republican U.S. Senate campaign in 2006 — a race Klobuchar won. In 2012, Newberger was elected to the Legislature. He wasn’t a high-profile lawmaker. Perhaps his biggest achievement was as chief House sponsor of legislation that cleared Xcel Energy to build a large gas-fired power plant in Sherburne County, which Gov. Mark Dayton signed and which Newberger touted as a bipartisan success. He also notes he secured funding for emergency response teams. In 2015, Newberger drew unfavorable attention for a remark during a House floor speech about a proposal to expand the North Star rail line to St. Cloud, which he said would “be convenient ... going from the [St. Cloud] prison to north Minneapolis.” Critics called the remark offensive and racist; Dayton called it “horrible.” Newberger publicly apologized a day later. Newberger showed the sledge hammer he carries in his vehicle that he uses to pound re-bar posts into the ground for yard signs. On a rainy September day, Newberger stopped at a nursing home in Morris to talk about regulations, the workforce shortage and the need for day care providers. While his campaign has one full-time staffer and four part-timers, he often campaigns alone or with his wife, Michele. Her husband is a gregarious extrovert who loves barbecuing, watching Star Trek and playing cribbage, she said, adding that he isn’t a “flashy guy.” The couple are empty-nesters after raising three daughters. Every week, they attend the evangelical Tri-County Alliance Church in Clearwater. In 13 months, Newberger said he’s trekked 56,000 miles; in that time, he’s had two debates with Klobuchar. He said he’s running in the frugal way he’s lived life, pointing to a cell charger from the Dollar Store. “If this race wasn’t winnable, I wouldn’t get into this,” he said, calling himself a "pit bull underdog" with "endless energy." Newberger recently toured Riverview farm in Morris, one of the largest dairy operations in the state. A rotating carousel milked 80 cows at a time with the assistance of workers, one wearing a Mexico hat. While he said he understands farms like Riverview depend on legal immigrants, Newberger said he supports Trump’s plan to build a wall on the Mexican border. When Trump visited Rochester earlier in October, Newberger was one of the only statewide Republican candidates the president didn’t call out. The party’s other U.S. Senate candidate, Karin Housley, was summoned by Trump to speak on stage while GOP candidate for governor Jeff Johnson and others got shout-outs. Newberger said he wasn’t upset. “That rally wasn’t about me,” he said. In the Minnesota Poll, a majority of likely voters disapproved of Trump’s job performance, but 95 percent of Republicans supported him. Newberger said he hopes to tap into that base. As he drank a Pepsi, he drove by cornfields and sporadic Klobuchar signs. By dinnertime, he arrived in Willmar as three dozen Republicans gathered for barbecue sandwiches. Klobuchar is “really nice,” Newberger told the crowd, but she’s too far left. He ticked off his views on a range of issues and spoke disapprovingly about how Senate Democrats like Klobuchar fought the Supreme Court nomination of Brett Kavanaugh. And he issued a warning against sharia, a set of Muslim principles, his voice rising passionately like a sermon.